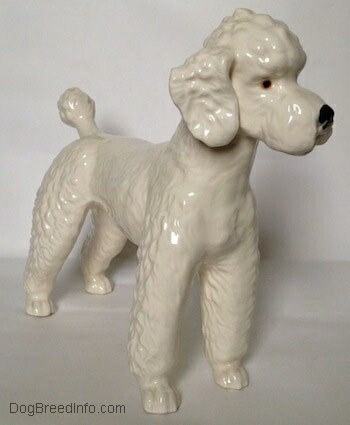 Pictured is a vintage Standard Poodle dog figurine from West Germany by Goebel. This guy is just beautiful. He is gray with rust brown highlights and a curious face. The pictures are nice but he looks even better in person. He is in excellent condition with no chips, cracks, breaks or repairs. There is a tiny bit of crazing on the belly. This guy is stamped with the Goebel bee inside the V above the 'bel' in the name Goebel. Below that it reads W. Germany. Under the blue Goebel stamp are two engravings. One is a date of 1969. The date indicates the year the mold was made. It is the logo that is the determining factor of the time period the actual piece was made. 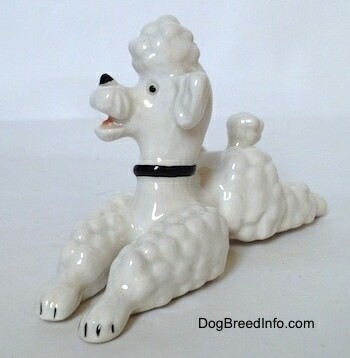 The logo this dog has is what collectors call the trademark 5 (TMK-5). It sets the date it was made between 1972 and 1978. The other is CH 620. This fairly large figurine stands 6 3/4 inches tall, 7 1/2 inches long from the tip of the nose to the back of the leg and 2 1/2 inches wide. 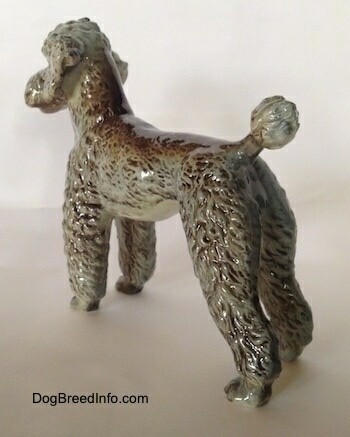 Vintage Standard Poodle dog figurine from West Germany by Goebel—image shows the Goebel bee inside the V above the 'bel' in the name Goebel. Below that it reads W. Germany. Under the blue Goebel stamp are two engravings. One is a date of 1969. 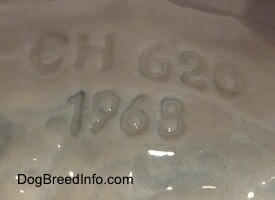 The date indicates the year the mold was made. It is the logo that is the determining factor of the time period the actual piece was made. 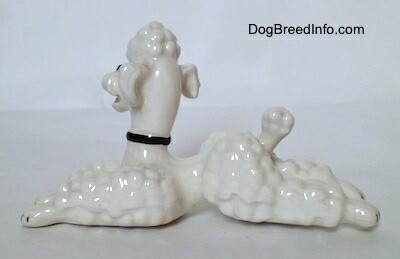 The logo this dog has is what collectors call the trademark 5 (TMK-5). It sets the date it was made between 1972 and 1978. The other stamp reads CH 620. 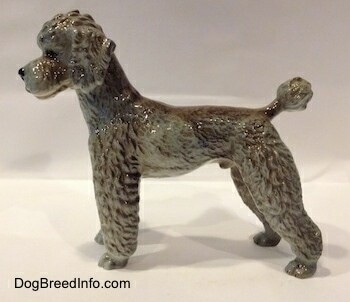 This is another gray with rust brown highlights Standard Poodle dog by Goebel, like the one above, except this one is older. It has the trademark 4 (TMK-4) logo stamped on the bottom in blue. This mark is nicknamed the three-line mark. This particular mark was used between 1962 and 1971. It is of a large V with a bee inside of it. To the right are the copyright symbol (C) and the word by. The second line says W. Goebel. The third line says W. Germany. Like the figurine above there is also an engraving that reads CH 620. It stands 6 1/2 inches tall from the ground to the top of the head, 7 1/2 inches long from the tip of the nose to the tip of the tail and 2 1/2 inches wide across the back from hip to hip. 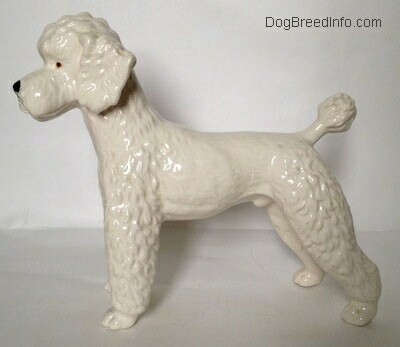 Vintage West Germany porcelain Standard Poodle dog figurine by Goebel—this piece must have once had a Goebel sticker on it because the trademark stamp is missing, however it is stamped with the date 1968, which represents the date the mold was first made. It also has an engraving of CH 620. 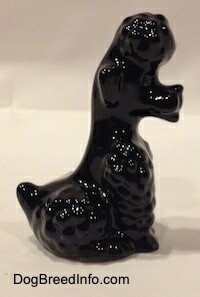 My guess is it is a trademark 5 figurine, which dates the figurine between 1972 and 1978. 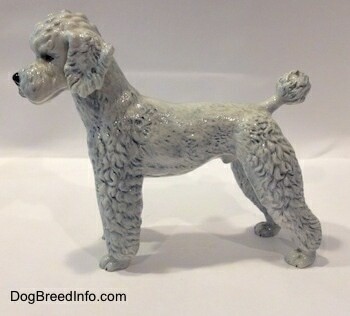 It is the white with a blue tint version, which some collectors call the silver-blue color, of the standing Standard Poodle. 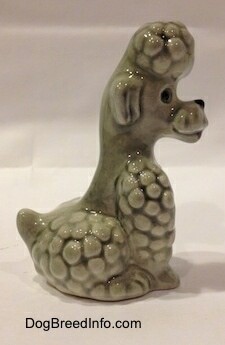 It stands 6 3/4 inches tall, 7 1/2 inches long from the tip of the nose to the back of the leg and 2 1/2 inches wide. 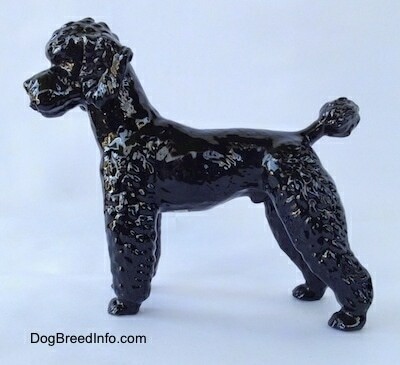 Vintage black Standard Poodle dog from West Germany by Goebel—this is a handsome, glossy fellah with a very deep black coloring and brown eyes. A nice, heavy figurine in great condition. Very sturdy. On the bottom is a silver and blue trademark 3 (TMK-3) sticker of a little bee inside the V. The bee’s wings are flush with the top of the V. Below the V it reads W. Germany. 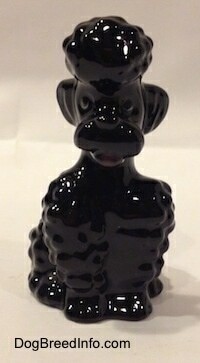 This Goebel logo sets the date of this figurine between 1957 and 1960. Above the sticker it is engraved CH 620. This is a large figurine that stands 6 3/4 inches tall, 7 1/2 inches long from the tip of the nose to the back of the leg and 2 1/2 inches wide. 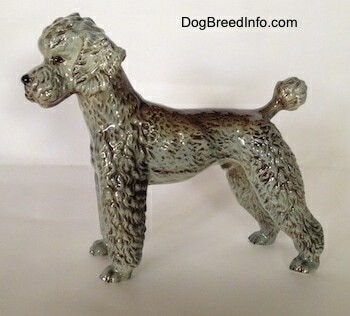 Vintage black Standard Poodle dog from West Germany by Goebel—image showing the original silver and blue trademark 3 (TMK-3) Goebel sticker of the smaller bee inside the V. The top of the bee’s wings are flush with the top of the V. Below that it reads W. Germany. 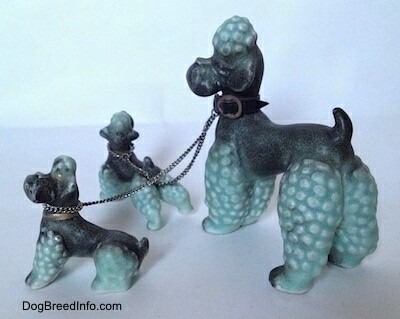 This sets the date of this figurine between 1957 and 1960. Above the sticker is an engraving that reads CH 620. 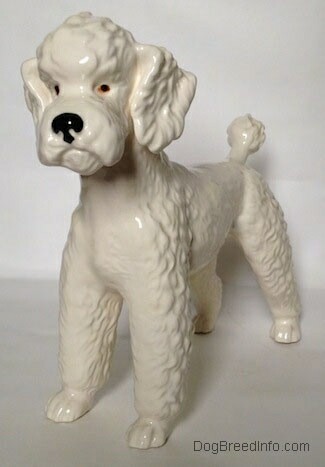 Vintage white Standard Poodle dog by Goebel—this glossy white Poodle has a black nose and black and orange eyes. 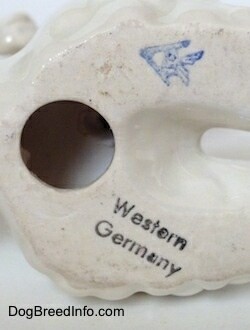 On the bottom is the trademark 6 (TMK-6) stamp in blue of the name Goebel with W Germany under it. 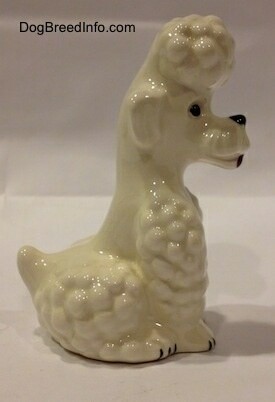 This Goebel logo sets the date of this figurine between 1979 and 1990. Next to the stamp is a date that reads 1969 and an engraving that I believe reads 30 62046. The last half of the number is very hard to read and I may have it wrong. This is a large figurine that stands 7 1/4 inches tall, 8 1/2 inches long from the tip of the nose to the back of the leg and 2 3/4 inches wide. 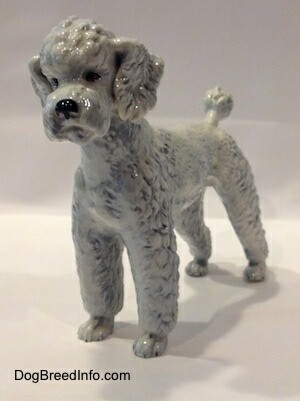 Vintage TMK-6 white Standard Poodle dog by Goebel—image showing the trademark 6 (TMK-6) stamp in blue of the name Goebel with W Germany under it. 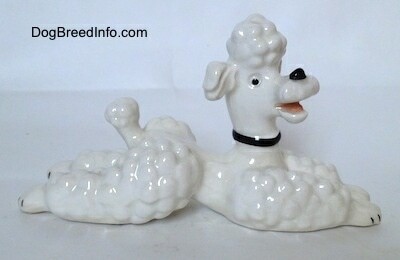 This Goebel logo sets the date of this figurine between 1979 and 1990. Next to the stamp is a date that reads 1969 and an engraving that I believe reads 30 62046. The last half of the number is very hard to read and I may have it wrong. 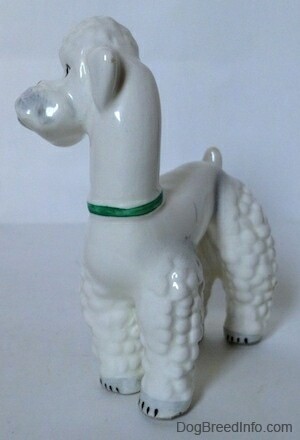 Vintage West Germany Poodle by Goebel—this is a white glossy dog in a sitting pose from the 1970s. On the bottom is the trademark 5 (TMK-5) logo of the bee inside the V above the 'bel' in the name Goebel. Under that it reads W. Germany. This dates the figurine between 1972 and 1978. There is an engraving that reads KT 160. There is crazing all over, but otherwise it is in nice vintage condition. 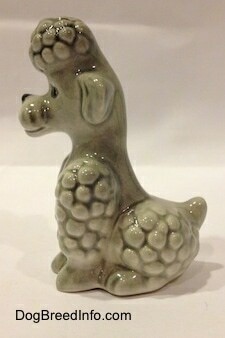 It stands 3 1/2 inches tall, 2 1/4 inch long from the front feet to the back of the tail and 1 3/4 inches from hip to hip. 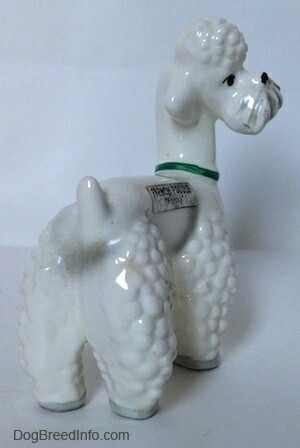 Vintage West Germany white Poodle by Goebel—image showing the engraving KT 160 and the trademark 5 (TMK-5) logo of the bee inside the V above the 'bel' in the name Goebel. Under that it reads W. Germany. 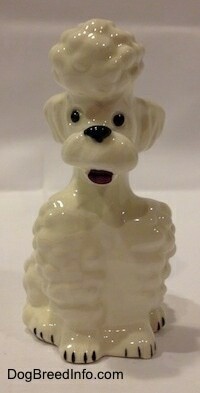 This dates the figurine between 1972 and 1978. 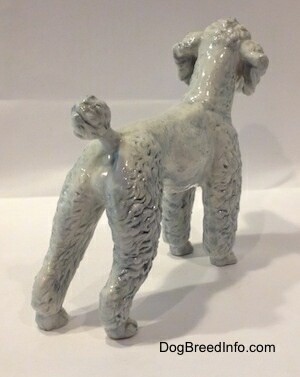 This is the gray version of the KT 160 Goebel sitting Poodle. 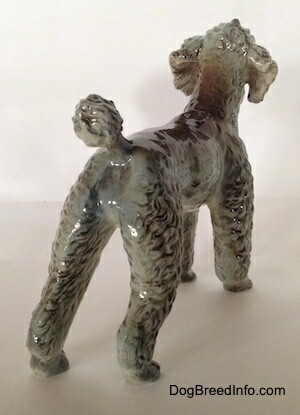 This figurine was made between 1972 and 1978. 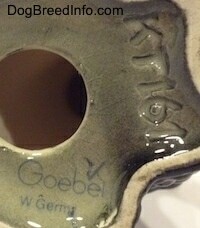 It has the trademark 5 (TMK-5) Goebel logo on the bottom stamped in blue. The gray color really brings out the details. It has a black nose, black eyes and a pink tongue. It is in great vintage condition with only a small amount of crazing. 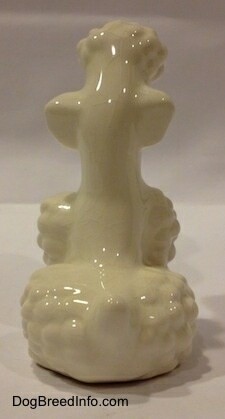 It stands 3 1/2 inches tall, 2 1/4 inch long from the front feet to the back of the tail and 1 3/4 inches from hip to hip. 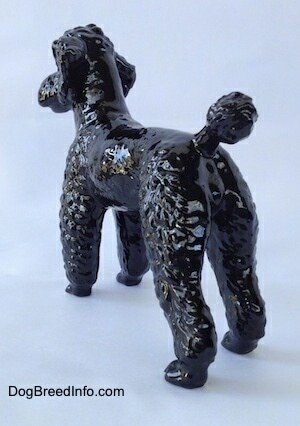 Gray version of the KT 160 Goebel sitting Poodle—image shows the trademark 5 (TMK-5) Poodle logo. 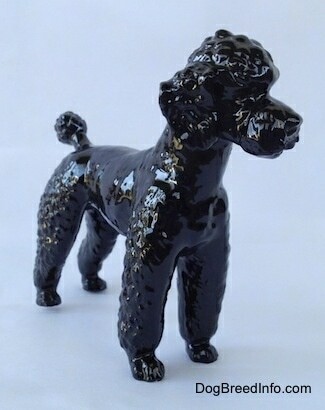 This is the black version of the sitting 1950s style Poodle made in the 1970s. 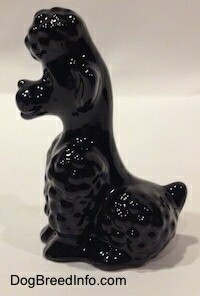 It is all black except for the pink tongue and the whites in the eyes; a glossy little thing in excellent condition. It stands 3 inches tall from the ground to the top of the head, 2 1/4 inch long from the front feet to the back of the tail and 1 3/4 inches from hip to hip. On the bottom is the trademark 5 (TMK-5) Goebel logo of the bee inside the V above the 'bel' in the name Goebel. Below that it reads W. Germany. There is an engraving that reads KT161. 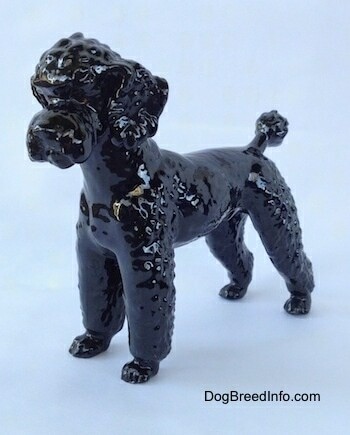 Vintage West Germany black Poodle by Goebel—image shows the trademark 5 (TMK5) Goebel logo of the bee inside the V above the 'bel' in the name Goebel. Below that it reads W. Germany. The blue stamp is worn off in some spots. It almost looks like the person who stamped it did not press hard enough. There is an engraving that reads KT161. 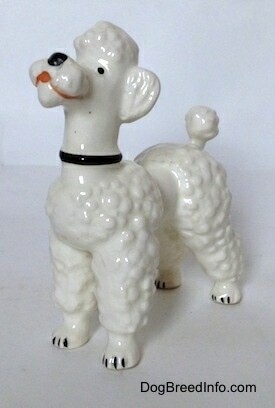 Pictured is a vintage 1950s Poodle figurine by Goebel. 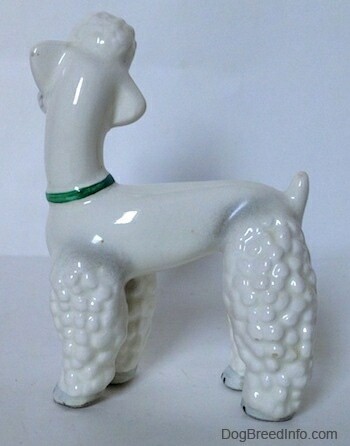 It is of a white dog in a standing pose wearing a green collar. The eyes, nose and toenails are black. 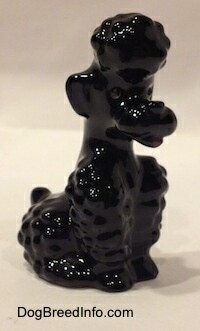 The mouth is painted black and the hair on the muzzle is gray. 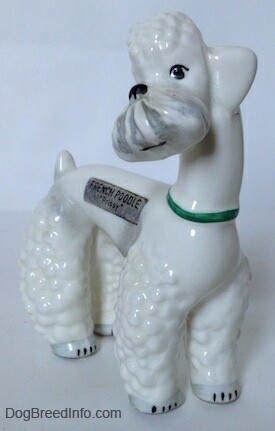 On the side of the figurine is the original silver and black sticker that reads French Poodle "Prissy". On the bottom of the figurine is the full bee inside the V Goebel trademark 2 logo. 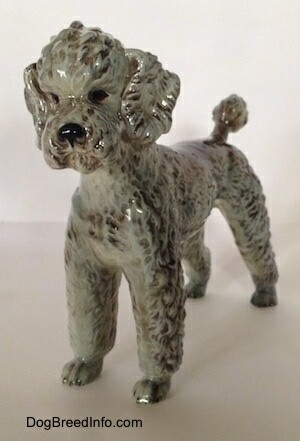 It dates the figurine between 1950 and 1956. Under the logo is a black stamp that reads Germany. It measures about 4 1/4 inches tall from the ground to the top of the head, 3 1/2 inches long from the side of the snoot to the back of the legs and 1 3/4 inches wide across the back of the legs. 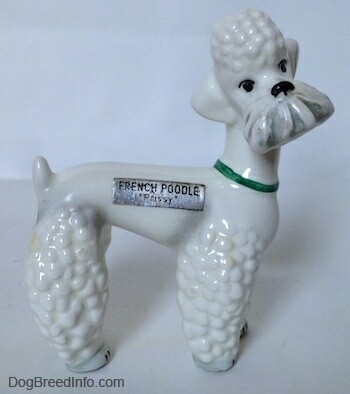 Vintage 1950s French Poodle figurine named Prissy by Goebel—image showing the full bee inside the V Goebel trademark 2 logo. It dates the figurine between 1950 and 1956. Under the logo is a black stamp that reads Germany. 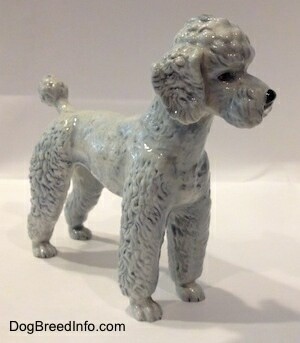 Pictured is a vintage 1950s Poodle figurine by Goebel. 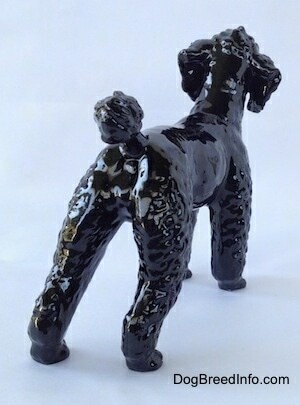 It is of a black dog in a standing pose wearing a green collar. The eyes are white with black dots. On the bottom of the figurine is the full bee inside the V Goebel trademark 2 logo. 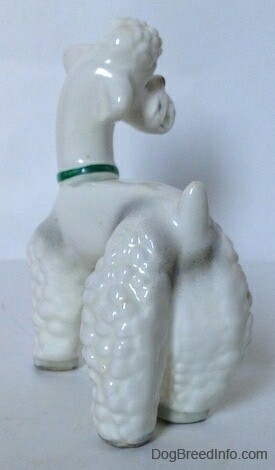 It dates the figurine between 1950 and 1956. It measures 3 1/2 inches tall from the ground to the top of the head, 3 inches long from the front of the snoot to the back of the legs and 1 1/4 inches wide across the front of the chest. 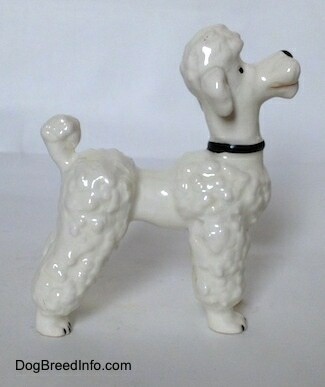 Vintage 1950s Poodle figurine by Goebel—image showing the full bee inside the V Goebel trademark 2 logo on the bottom of the front right paw. It dates the figurine between 1950 and 1956. 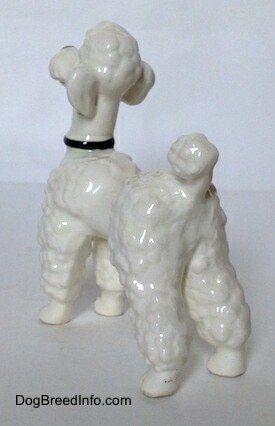 Vintage Goebel porcelain Poodle family (adult and two puppies) from West Germany—judging by the original sticker on the bottom of the adult this set was made between 1972 and 1978. This set is in excellent condition with no chips, cracks or repairs. They have a nice shiny gloss finish. 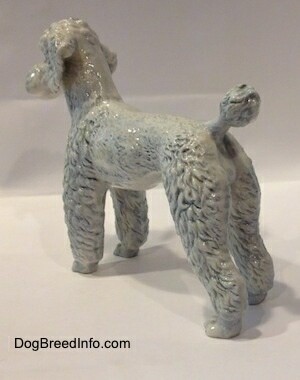 The adult Poodle is 3 inches high, 2 1/2 inches long and 1 1/2 wide. The puppies are 1 1/2 tall from the ground to the top of the head, 1 1/2 inches long from the tip of the snoot to the back of the legs and 1/4 inch wide. 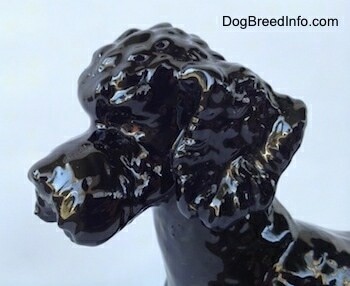 It is a little hard to see in the picture, but the adult Poodle has very nice eyes. 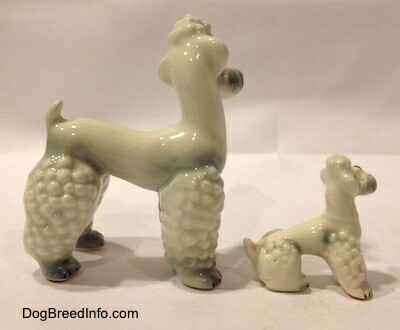 Vintage Goebel porcelain Poodle family (adult and two puppies) from West Germany—image showing the original Goebel W. Germany sticker on the bottom. 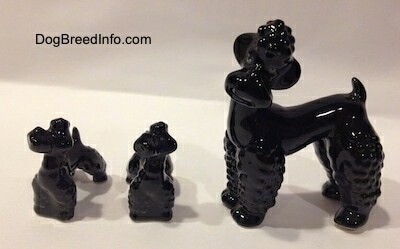 The year of the Goebel figurines can be judged by the layout of the sticker or stamp. 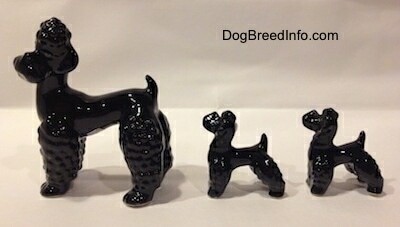 This set has a sticker instead of a stamp, most likely because a stamp would not show up over the deep glossy black finish of the dog. 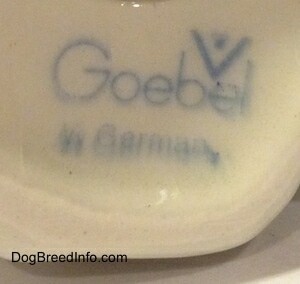 The sticker shows a V on top of the bel in Goebel with a bee inside of the V. Under that are the words W. Germany. 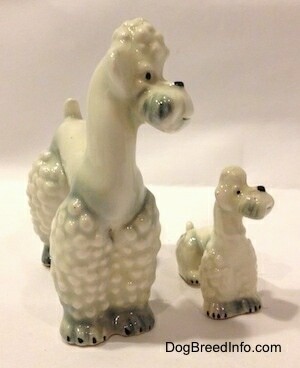 Pictured is a vintage Poodle figurine set of an adult dog with its puppy by Goebel. They are white with spots of gray, a black nose, eyes, mouth and toenails. 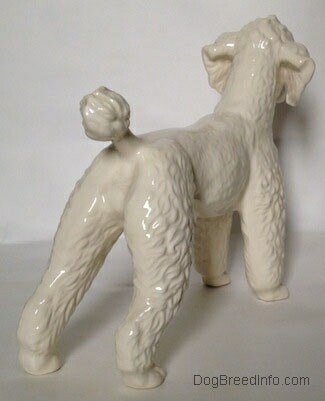 The adult dog is in a standing pose. On the bottom is the Goebel trademark 3 logo of the small bee deep inside the V dating the figurine between 1957 and 1963. It measures 3 1/4 inch from the ground to the top of the head, 2 1/2 inches from the front of the snoot to the back of the leg and 1 1/2 inch wide across the back from hip to hip. The puppy is in a sitting pose. 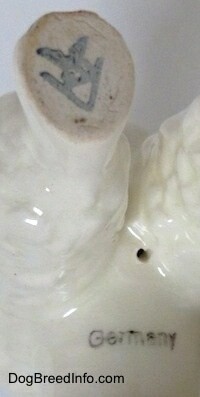 On the bottom is the Goebel trademark 2 of the full bee inside the V dating the figurine between 1950 and 1956. It measures 1 5/8 inch from the ground to the top of the head, 1 1/2 inch from the front of the snoot to the back of the tail and 3/4 inch wide across the front paws. 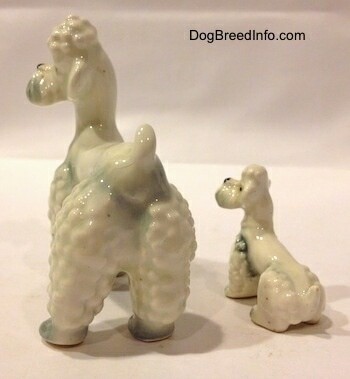 Vintage Poodle figurine set of an adult dog with its puppy by Goebel—image showing the adult dog's Goebel trademark 3 logo of the small bee deep inside the V dating the figurine between 1957 and 1963 (left) and (right) the puppy's Goebel trademark 2 of the full bee inside the V dating the figurine between 1950 and 1956. 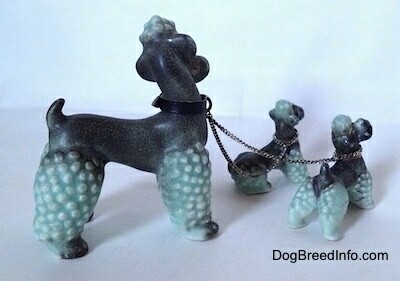 Vintage Goebel porcelain Poodle family (adult and two puppies) from West Germany—the family is chained together with a thin silver chain. 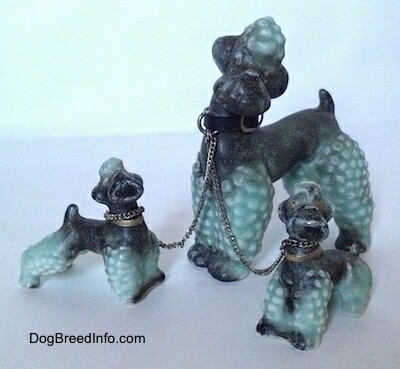 The adult dog has a black leather collar connecting the chain. 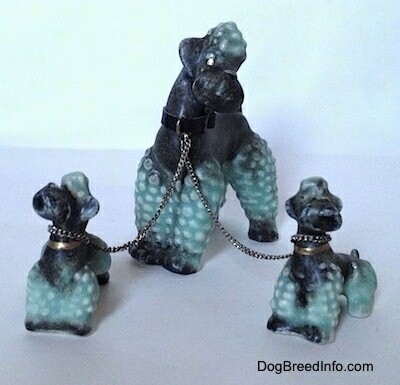 The puppies have the chains looped directly around their necks. The family is green and black with gold painted eyes. They also have gold painted collars. 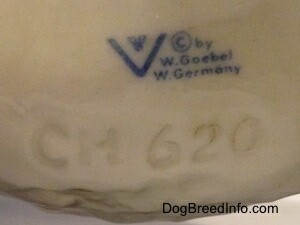 On the bottom of the adult dog is a blue stamp of the trademark 2 (TMK-2) Goebel logo of the full bee inside the V. The stamp dates the figurines between 1950 and 1956. Next to that is an (R) stamp. On the bottom of the adults front paw is a number engraving that reads 55. 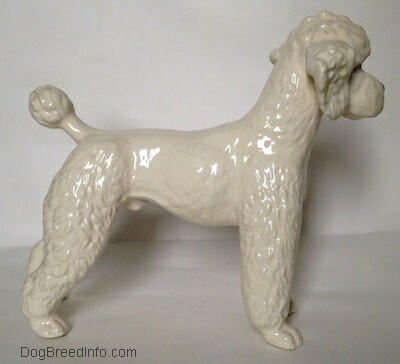 The adult Poodle is 3 inches high from the ground to the top of the head, 2 1/2 inches long from the back legs to the end of the snoot and 1 1/2 wide across the back legs. The puppies are about 1 1/2 tall from the ground to the top of the head, 1 1/2 inches long from the tip of the snoot to the back of the legs and 1/2 inch wide. 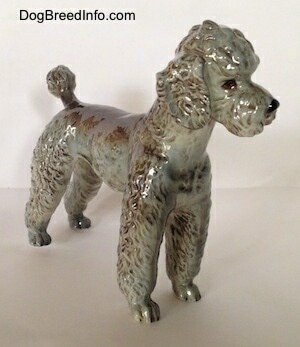 Pictured is a vintage 1950s Poodle figurine by Goebel. 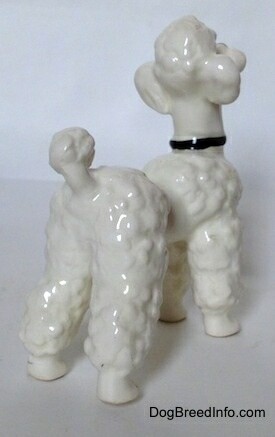 It is of a white dog in a standing pose wearing a black collar. The eyes, nose and toenails are black. The mouth is painted a burnt-orange color. On the bottom of the figurine is the full bee inside the V Goebel trademark 2 logo. It dates the figurine between 1950 and 1956. 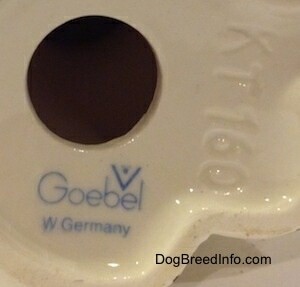 On the belly of the dog is a black stamp that reads Germany. It measures 3 1/2 inches tall from the ground to the top of the head, 3 inches long from the front of the snoot to the back of the legs and 1 1/4 inches wide across the front of the chest. 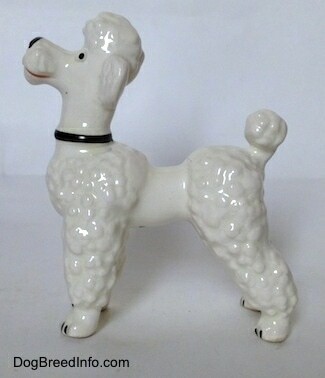 Vintage 1950s Poodle figurine by Goebel—image showing the full bee inside the V Goebel trademark 2 logo. 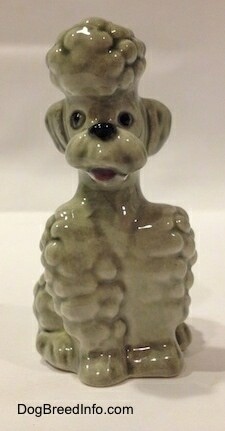 It dates the figurine between 1950 and 1956. 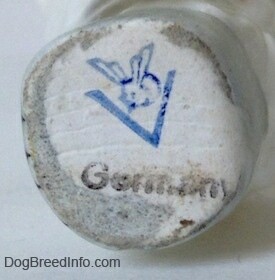 On the belly of the dog is a black stamp that reads Germany. 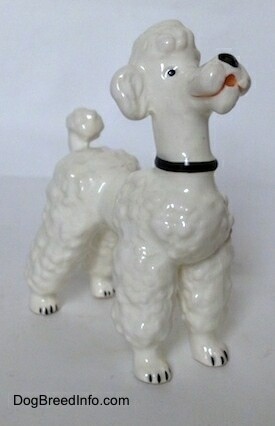 Pictured is a vintage 1950s Poodle figurine by Goebel. 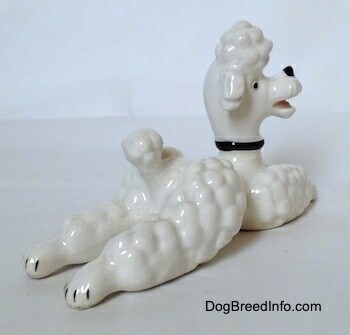 It is of a white dog in a laying pose wearing a black collar. The eyes, nose and toenails are black. The mouth is painted a burnt-orange color. On the bottom of the figurine is the full bee inside the V Goebel trademark 2 logo. It dates the figurine between 1950 and 1956. 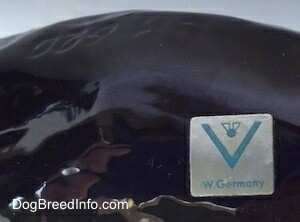 On the belly of the dog is a black stamp that reads West Germany. It measures 2 1/2 inches tall from the ground to the top of the head, 4 3/4 inches long from the front paws to the back paws and 1 1/2 inches wide from hip to hip. 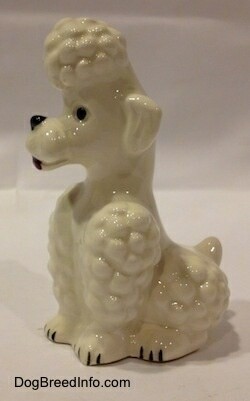 Vintage 1950s Poodle figurine by Goebel—image showing the full bee inside the V Goebel trademark 2 logo. It dates the figurine between 1950 and 1956. On the bottom is a black stamp that reads West Germany.